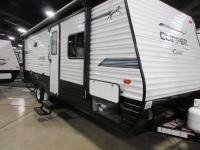 This unit is perfect for a family of four to five that enjoys inside comforts after venturing outdoors! Just imagine cooking on a three burner range or with the microwave, and storing plenty of food in the refrigerator and pantry for a week-long stay. 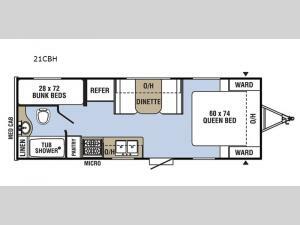 You will surely appreciate your own full bathroom to be able to take a bath or shower before bedtime as well as store towels in the linen cabinet. 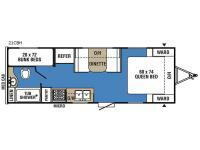 You can sleep on a queen bed, a set of bunks beds or even on the dinette if needed. The campground is waiting for you!